Denver is the largest city in the epic Rocky Mountains region of the United States and sits exactly one mile above sea level. It is also considered one of the fastest growing cities in the United States. The city is home to over 600,000 people and a place to find a plethora of museums displaying some of the greatest Western and American Indian art collections. It is common to see residents of the city hiking, running or biking through the city daily. Denver is a vibrant city with lots of great outdoor activities for both the young and old. Whatever your reason for being here, you are sure going to experience great and remarkable moments. Spectacular views, fine dining experience, cozy hotel accommodation, and easy access to the magnificent Rocky Mountains, all makes Denver a must visit for travelers. If you come to Denver looking for great outdoor recreation, you will be surprised to find it in abundance here. Located about 29 km northeast of downtown, The Denver International Airport is set in the middle of rolling plains with the Denver and beautiful Rocky Mountain to the west. Starting operation in 1995, Denver International Airport, also known as DIA, is currently United States largest airport by area and also has the country’s longest public use runway, which is approximately 16,000 feet long. 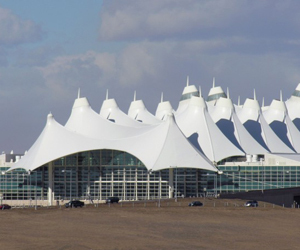 DIA is the primary airport of the State of Colorado and it offers flights to Denver and other surrounding counties. It was given the Global Award for Best Food Beverage-Related innovation and also was ranked among the top 10 best airports in the world. This award winning airport has six long runways and also a hub to Great Lakes, Frontier and United Airlines. Over 50 million passengers use the airport annually, making it one of the busiest airports in the world. Jeppesen Terminal is the main terminal of the airport. Aeroméxico, Icelandair, Air Canada, British Airways, Lufthansa, and Volaris offer non-stop flight to several international destinations. With the airport shuttles, taxis, buses and trains, travelers can reach their destinations in a stress-free and convenient way. On arriving at the airport, travelers will see cowboy-hat-wearing ambassadors welcoming them warmly into the beautiful city of Denver. Book cheap flights to Denver and visit this great city. The city of Denver is renowned for its wild weather fluctuations at any time of the year. However, the weather conditions in Denver is rendered quite pleasant. When you think of visiting this beautiful city, you most likely think of skiing or hiking. Denver is one of the best destinations in the world where travelers can enjoy such amazing outdoor activities. The best time of the year to visit Denver is during spring. Spring is pleasant and offers visitors an opportunity to enjoy the best hiking experience ever. There is absolutely no season that is busier than another in Denver, because the city has a lot to see and do all through the year. There can never be a disappointing moment whenever you plan on visiting Denver, as you will be occupied with one activity or the other, regardless of the season of the year. Check available cheap domestic flights. cheap flights to Denver and visit this great city. Mobissimo has multiple ways to help travelers find cheap flights to Denver. You can subscribe to our weekly cheap flights and deals newsletter which includes great deals on cheap flights. We provide an Airfare Index that you can subscribe to on our front page which will alert you to the cheapest flights to Denver via RSS. When your search on Mobissimo is finished we provide a recommendation box with dates when the flight to Denver is the cheapest. There's our Facebook page where you can connect to people who are looking for great deals to Denver and where we also post cheap flight deals regularly. Our blog provides highlights of sales on flights on major carriers. We also have a flights deals page that is updated daily. If you're looking for cheap domestic and international flights to Denver, USA , it helps to be flexible with your travel dates. Being able to leave on a Thursday or come back on Monday, and taking early morning flights, will help you find cheaper flights than the busy and popular early evening flights and late afternoon flights for Denver. Searching during the travel off season for Denver will also help you find the best fares. Keep in mind to search for the cheapest flights to nearby cities airports. Mobissimo is the ultimate travel search engine for all USA destinations.